At a time when a booming economy has led to record freight shipments, the trucking industry is struggling with a severe shortfall of drivers. And long-haulers aren’t alone. Delivery services, cab companies, even ride-sharing services like Uber and Lyft are struggling to find the drivers they need to keep their freight and passengers moving. Ironically, this shortage could wind up turning into a glut in the not-too-distance future that will see a huge disruption in the American workforce. There are currently about 3.5 million professional truck drivers in United States, according to the American Trucking Associations. And the number has been rising fast as more and more freight takes to the road. Trucks are expected to handle 10.73 billion tons of goods this year, or two-thirds of the nation’s total, according to the ATA, with the figure forecast to grow a compounded 3 percent annually over the next five years. To handle that load, trucking companies need to recruit about 90,000 new drivers annually, but the trade group predicts the industry will fall 50,000 short of its goal this year, a trend that has been growing worse since the economy began to recover. At a time when factory jobs are generally in decline, becoming a professional driver is one way to make a decent living without more than a high school diploma. And demand has grown not only in the trucking industry but for taxis, buses, limousines, and ride-sharing services. Uber and Lyft, in particular, have been fighting it out for qualified drivers, with Uber recently accused of using dirty trucks to lure contract help away from its smaller rival. All told, research by Harvard University estimates 5 million Americans now make a living, or at least work part-time, as professional drivers. But things may look quite different not that long from now. One year ago this week a truck rolled into history as it traveled from a Colorado brewing plant to a warehouse 120 miles away carrying 45,000 cans of Budweiser beer. The early morning run was done using a truck developed by a start-up called Otto, now an Uber subsidiary. Though there was a specialist seated in the truck’s sleeper berth to monitor things along the way, there was no driver behind the wheel. The ultimate goal for many freight-haulers is to take humans out of the truck entirely. Proponents cite a wide range of advantages, including reductions in traffic congestion and a significant improvement in highway safety. There’s also a financial carrot, said CAR’s Cole. “A long-haul driver is limited in the number of hours they can drive before taking a break,” but a robotic truck can operate pretty much 24/7 – and without claiming a paycheck at the end of the week. Despite the potential payoff, the ATA is currently taking a conservative approach. Spokesman Sean McNally told NBC News the group expects to see drivers remain onboard most trucks “as a failsafe,” for the foreseeable future, much as two pilots remain aboard commercial airliners, even though many are now so automated they could take off, fly, and land robotically. For its part, Daimler AG’s Freightliner brand’s autonomous prototype, the 18-wheel Inspiration model, is designed to have a backup “operator” behind the wheel. But officials at Freightliner and other manufacturers – along with several trucking companies – quietly acknowledge they want to go fully driverless as soon as possible. The challenge is not so much coming up with the technology but winning the confidence of the public sharing the road with 70,000 semi-trucks. The other challenge is trying to maintain peace with labor unions, especially the Teamsters, representing many of the drivers whose jobs could be at risk. According to many observers, the real question is not if, but how soon, driverless trucks – and passenger cars - will take to the road. New rules Congress is working on could speed up the development process by permitting more testing on public roads. How many driver jobs are at risk is uncertain, at least initially. Experts predict that driverless technology will be phased in over a period of years, perhaps even a decade or more, with the biggest impact initially seen with long-haul trucks. That’s because Cole and others say it’s easiest to develop the hardware and software needed to handle the relatively predictable conditions trucks face on limited-access freeways. 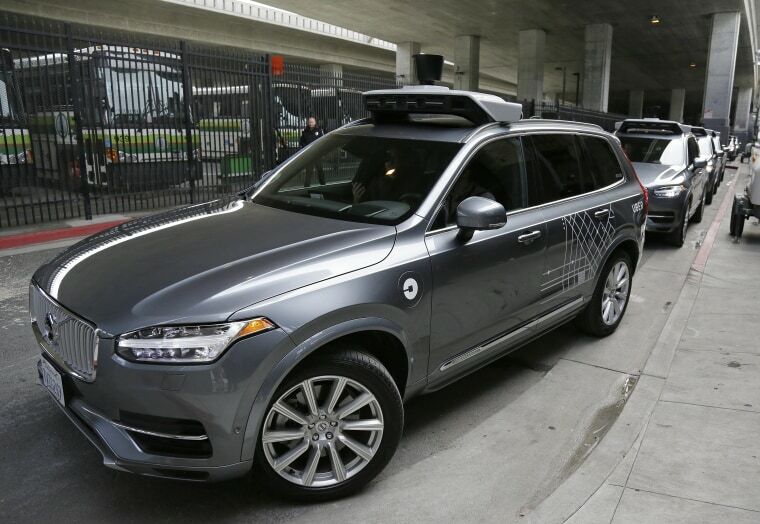 But companies like Uber and Lyft are convinced they’ll be able to automate their vehicles, as well, and promise that this will lower the cost of hailing a ride to the point where it becomes cheaper than actually owning a personal vehicle. As a result, the Boston Consulting Group estimates that perhaps one-quarter of the miles Americans travel by 2030 will be in driverless vehicles operated by ride-sharing services. Perhaps the biggest challenge will be finding ways to automate local delivery services, whether a big brown UPS truck or the car driven by a high school student for the local pizza parlor. Domino’s, which is based in Ann Arbor, Michigan, recently partnered with Ford on a pilot program in its home town. Customers opting in on the project have to go outside and punch a code into a keypad on the side of a specially modified, autonomous Ford Fusion then reach inside to pull their pie out of a special warming oven. In the future, services like FedEx and UPS might adopt a similar process, or even use robots or drones that could pick up packages and move them those last 50 feet. It might remain too difficult to automate all professional driving jobs, experts caution, but the trendline seems obvious, and as many as 5 million part and full-time jobs could vanish over the next decade or two. That does give time to consider what to do with all that manpower. CAR’s Cole warned that the country will need to make a push to retrain drivers “for more skilled jobs.